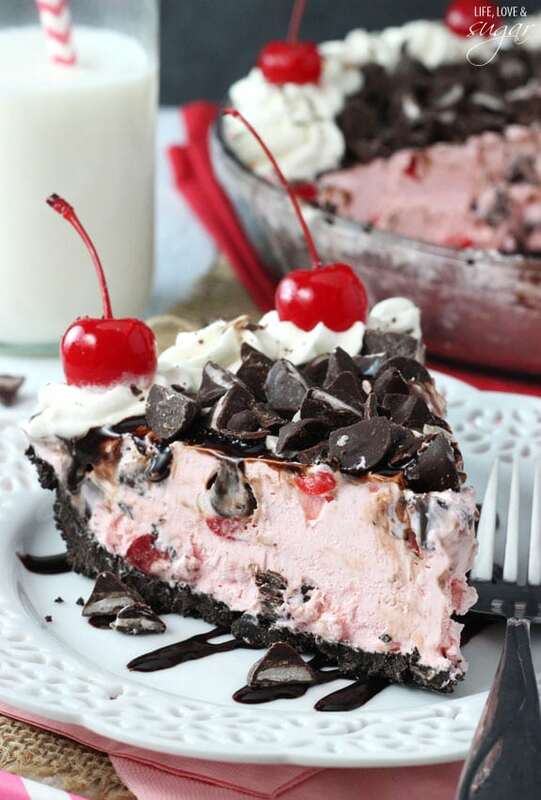 This Chocolate Cherry Ice Cream Pie is so delightful and refreshing. 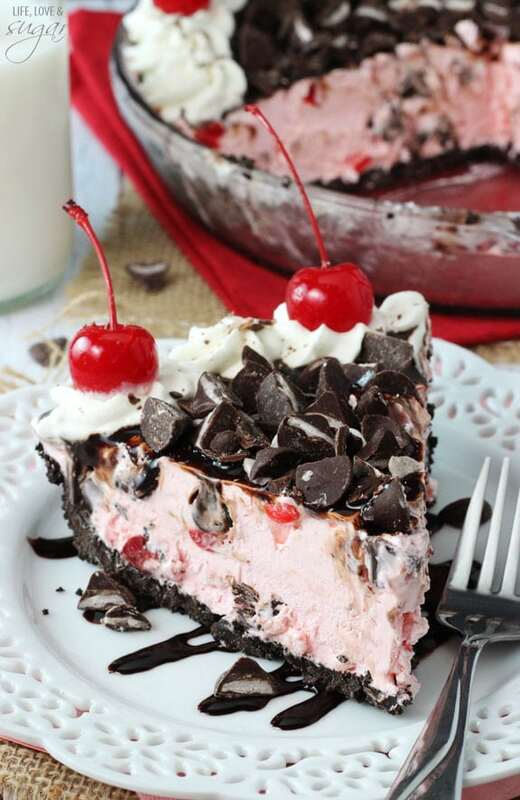 I absolutely love the sweet, light cherry flavor of the ice cream mixed with the chocolate. And to make it even better, it uses my new favorite baking morsels – Nestlé® Toll House® DelightFulls™ Baking Morsels! I’m so excited to share this recipe with you today. I’ve seen these DelightFulls Filled Baking Morsels in the store a number of times and I’ve been really excited to bake with them. I’m a big fan of Nestlé products in my baking and I love the idea of having two flavors combined into one amazing baking morsel. I used the dark chocolate cherry ones for this recipe, but there are also peanut butter, caramel and mint versions. It’s awesome! Now instead of buying two kinds of morsels, you can buy one that combines both flavors. That’s a money saver right there. 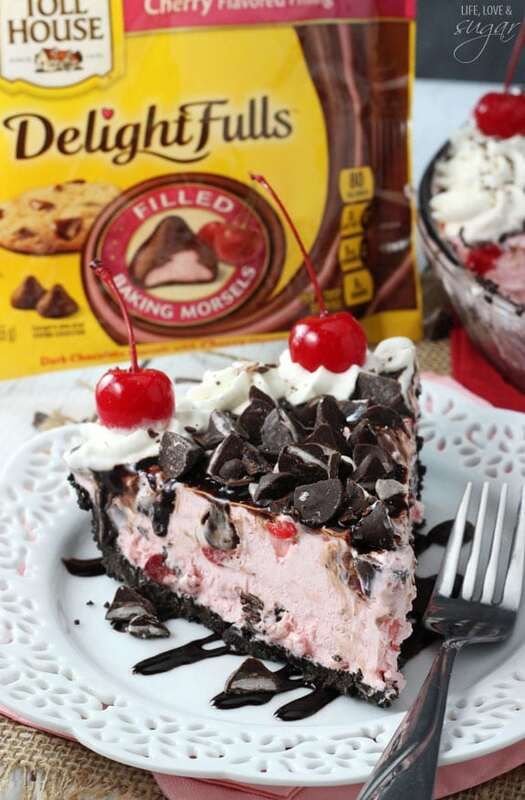 I decided to use my DelightFulls Filled Baking Morsels in an ice cream pie. 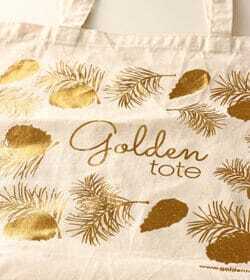 My birthday is just over a week away (Christmas!) and I love having ice cream treats for my birthday. The flavor options are endless! So I was pretty excited to make this chocolate and cherry version. The whole recipe is nice and easy and doesn’t require any baking or an ice cream maker – both are big pluses for me! The crust is a combination of chocolate cookie crumbs and melted butter. The mixture gets pressed into the pie pan and you’re done. 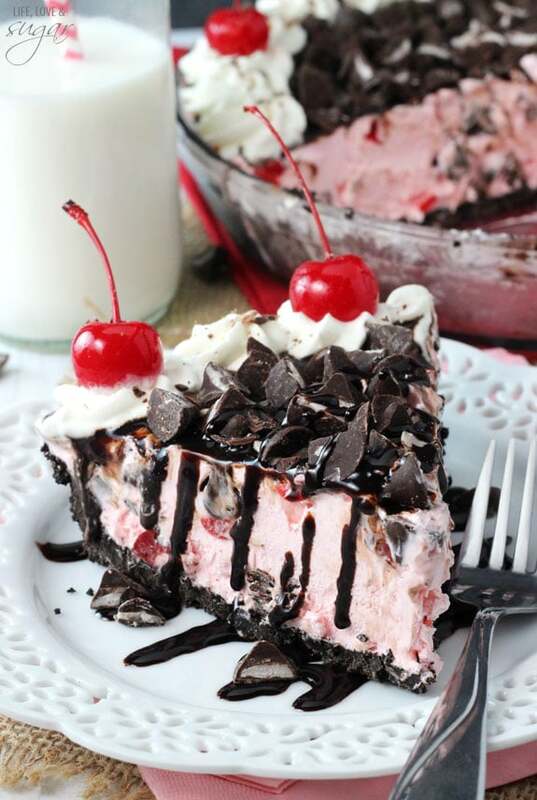 For the ice cream, I used a combination of maraschino cherry juice and DelightFulls Filled Baking Morsels to give the ice cream it’s wonderful chocolate and cherry flavor. I love how to the morsels add the perfect crunch to the ice cream! And with every bite into one of the morsels, you get that extra pop of cherry flavor. The base of this ice cream is cream cheese, sugar, milk and whipped cream. It makes such a creamy ice cream – you’d never even know it’s not made with an ice cream machine. I can’t tell you how many people have been surprised when I tell them what’s it in. They’re always so surprised and think the ice cream is store bought. 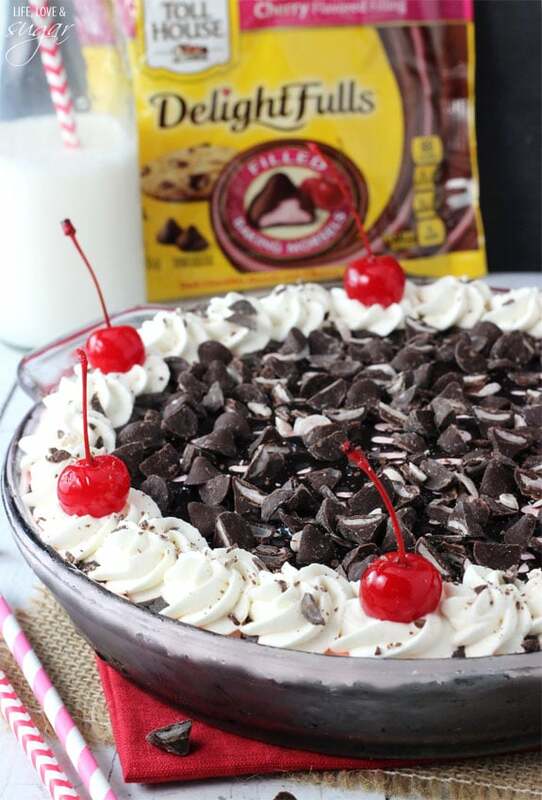 The ingredients for the ice cream all get mixed together and poured into crust. Then pop it into the freezer to freeze. Once ready to serve, you can add whipped cream, chocolate sauce and additional DelightFulls Baking Morsels. I cut my morsels in half, so you can see the pretty cherry filling. Be sure to check out the new DelightFulls Baking Morsels – they are awesome! This is a sponsored conversation written by me on behalf of NESTLÉ® TOLL HOUSE®. The opinions and text are all mine. 1. Add melted butter to cookie crumbs and mix until combined. 2. Press cookie mixture evenly into the bottom and up the sides of a 9 inch pie pan, then set aside. 3. 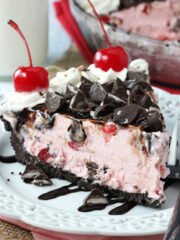 Combine cream cheese, sugar, milk and maraschino cherry juice together and mix until completely combined. 4. 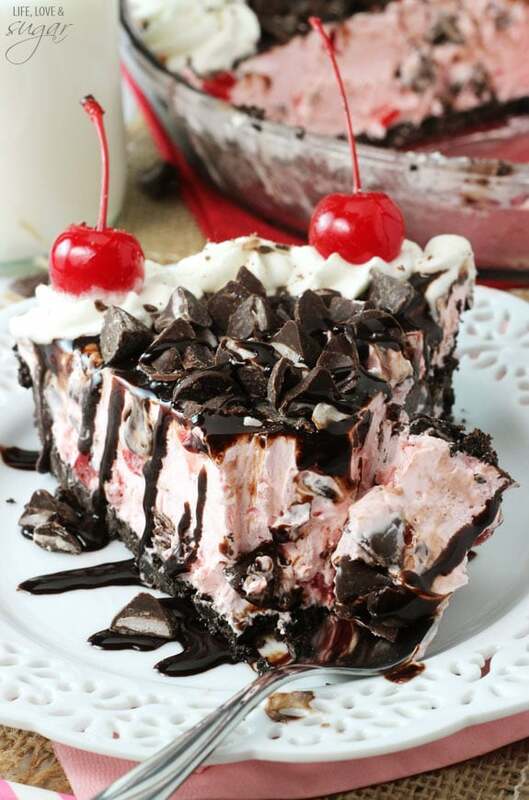 Fold in the whipped cream, chopped cherries and Nestle Toll House Delightfulls. 5. 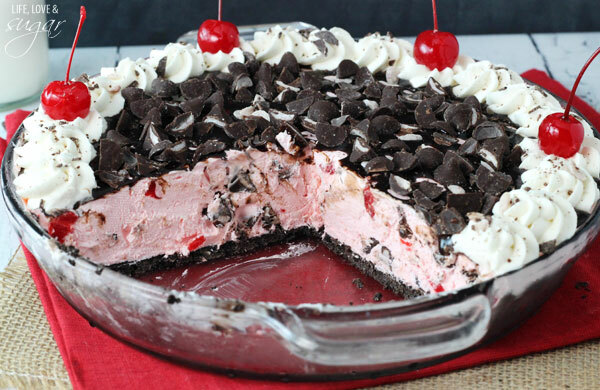 Spread ice cream filling evenly into crust and freeze for several hours, until firm. 6. When ready to serve, top with whipped cream, chocolate sauce and additional Nestle Toll House Delightfulls. The same NESTLÉ® TOLL HOUSE® chocolate you know and love now filled with rich caramel, peanut butter, mint, and cherry flavored filling. Add these new filled baking morsels to your favorite recipes for a special twist on the classic, or try experimenting with them in a recipe you’ve never tried before! Okay, I LOVE the filled chips. The PB one has been very dangerous in my house, as has the caramel. 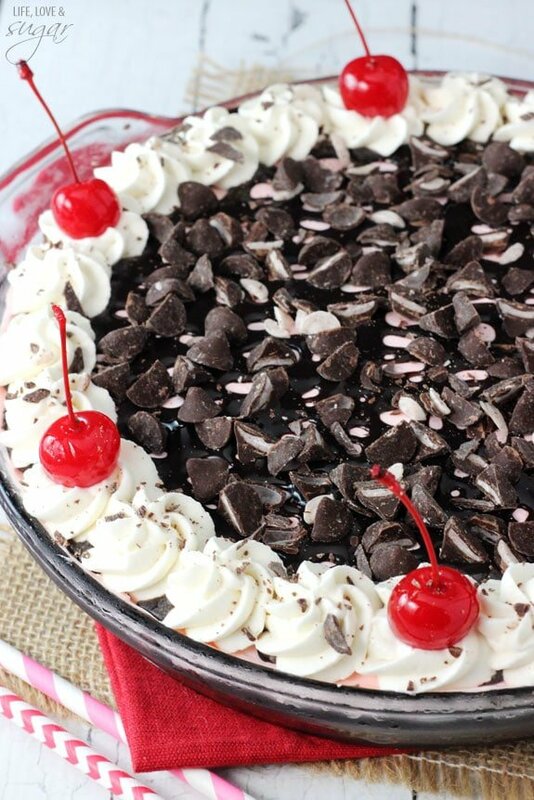 Your pie is heaven, Lindsay! So pretty and amazing! I saw those morsels at the store and they look so delicious and HUGE! Your birthday is on Christmas?! I have been eyeing those morsels up at the grocery store and I just need to buy them already! 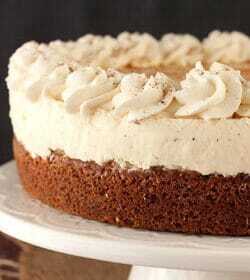 This looks marvelous and love that there’s not baking with this treat!